AVCWare Video Converter Standard 7.7.2.20130418 - Download Win Apps. Capable of converting nearly all popular video formats..
AVCS is capable of converting nearly all popular video formats like AVI, MPEG, WMV, DivX, MP4, RM, MOV, XviD, 3GP and audio formats MP3, WMA, WAV, RA, M4A, AAC, AC3, OGG between each other. With AVCS, you can convert any video/audio/animated picture to make it playable on your PSP, PS3, iPod, iPhone, Apple TV, Xbox, Google phones, iPad and other digital multimedia devices. 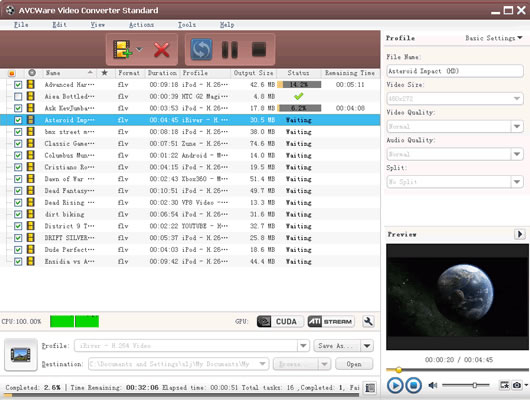 With its straightforward interface design and powerful conversion engine, it helps you convert almost all popular video formats on Mac such as AVI, MP4, MPEG, WMV, DivX, H. 264/AVC, MKV, RM, MOV, XviD, 3GP, etc. In comparison to AVCWare Video Converter Standard is powerful and ideal DVD rip software for Mac users to rip your DVD movies to popular formats like MPEG, AVI, WMV, DivX, MP4, H. 264/AVC, RM, MOV, 3GP videos, and MP3, WAV, WMA, AAC, audios, etc.